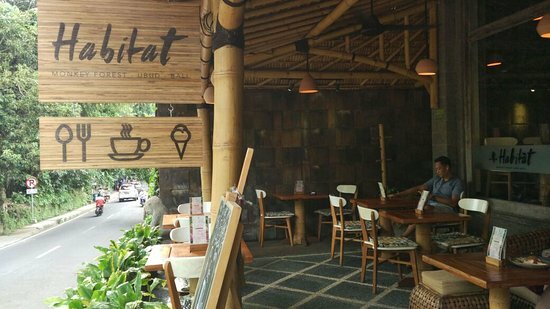 Ubud is a highly recommended destination for those visiting Bali, whether it be as a day trip or as a main place to stay. It’s located in the mountains of Bali about an hour and twenty minutes north of Denpasar airport (DPS). There are tons of guides and must do lists for Ubud Bali that cover the basic sites to see and things to do, if visiting for a day or longer. In my two weeks in Ubud I focused on visiting a handful of restaurants, relaxing at hotel pools, shopped it’s many boutiques and visited the Sacred Monkey Forest Sanctuary. Since this was my second visit to Ubud I skipped the sightseeing but would recommend places like Goa Gajah, Tirta Empul and the famous Tegallalang Rice Terraces for first time visits. Alaya Resort Ubud: Located just a 10 minute walk from the Sacred Monkey Forest Sanctuary and next door to the Yoga Barn, Alaya is a very affordable spa resort overlooking a rice padi and designed with a blend of Balinese and modern aesthetics. My rate included breakfast and they also serve a complimentary afternoon tea from 3-5. I indulged in spa treatments at their spa, Dala, which costs 4x more than the spas lining the streets of Ubud, but they make up for this cost with serene ambience and impeccable service. There are lots of restaurant options in walking distance to the hotel and you can even catch the free Monkey Forest Sanctuary shuttle to get around Ubud if long walks aren’t your thing. On my first visit to Ubud I had dinner at Bambu Indrah and I’ve had many friends stay here as well. It’s an Eco lifestyle boutique hotel located outside of Ubud town center so you’re able to get away from the hustle and bustle of town and enjoy the scenery of the mountain rainforest and terraced rice fields. Hoping to stay here on my next visit to Bali. I visited the famous Jungle Fish pool at this resort and spa and would definitely book a few nights here on my next visit to Bali as well. Their infinity pool overlooks a lush jungle and is a picture perfect setting for what you imagine a Balinese getaway to be. Clear Cafe : International menu with lots of healthy vegetarian options. They do breakfast, lunch and dinner very well and it’s a cool place to hangout and cool down after shopping. Seniman Coffee Studio : This place does much more than coffee. Great spot for a meal as well and the wifi is consistently good. I went in the evening but the breakfast menu also looks compelling. Spice By Chris Sans : Nice spot for dinner or cocktails. Menu is innovative and the staff is very welcoming and friendly. Habitat: Nice cafe near the Monkey Forest. Had a simple fruit and yogurt but the service and space stand out in my memory. Would visit again on my next trip to Ubud. Watercress: Went twice. Once for breakfast (smoothie bowl) and once for lunch (sandwich). Both meals were great and the service was on point. It’s walking distance from the Monkey Forest so a good place to go before or after your visit to the Monkey Sanctuary. Jambali Cafe: One of my favorite meals in Ubud. So good I went twice. It’s the only Jamaican restaurant in Ubud and probably all of Bali. Michelle the owner is warm and welcoming and has created a space where people can easily meet new people and share stories. Below are some ideas on things to do in Ubud that might not be on everyone’s must see/must do list that I really enjoyed.